So, we now know some basics about Print books, but what about Ebook layout?? Thanks to the super popular e-reading devices flooding the market today, print is not the only format a self-publisher need worry about. Ebooks are completely different from their paper-bound counterparts when formatting and layout are concerned. In some ways though, Ebooks can be easier to format, however due to the variety of readers on the market, you may have to create various different layouts. 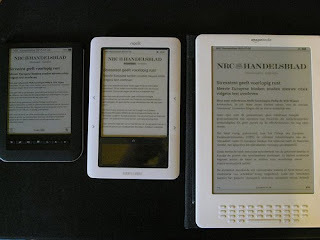 In the Ebook world, you have two popular formats Epub and Kindle/MobiPocket. (these are not the only formats, they are just the most common.) It is recommended that you format your ebook for both of these if you wish to reach a wide variety of devices. For Epub there are quite a few options out there. I use Ecub 1.11 right now, but a simple Google search will bring up plenty of options. Step 1 -Layout your Word document as you would if you wanted to create a PDF. *Don’t worry about adjusting page sizes; use your standard 8.5x11 page size with 1 inch margins. *Do not use fancy fonts. Times Roman and Arial are standard. Do not use excessively large font sizes either. 10pt-14pt is standard. Page 1 should be your cover image. Insert the image and size it and center it so it takes up the whole page. Page 2 would be a title and published by page. *It would be a good idea to brush up on some basic HTML formatting language. It’s not necessary but it will come in handy if you want to have chapter titles and a Table of Contents in your book. See Mobi Pocket FAQ for details on that. *One trick I like to use is to download the Kindle for PC program. This is a free program that will read your PRC file. It’s a good idea to check your work here before uploading it to DTP. If done correctly, you can have a clean-formatted Kindle-ready file in under 2 hours. As I said, it is a lot easier than the print formatting. Unfortunately though Kindle files are only read by Amazon kindle, so you will still have to create another format for the next e-reader you want to make your book available on. There is an indie site Smashwords.com that will format your ebook for a wide variety of readers; however, it requires you to adhere to their specific formatting guidelines. To list your book with their site, they will take a small cut from your sales but it can be worth it. I highly recommend using this site if you are new to e-publishing as it will help you get your book on Apple, Nook, Kobo, Sony, and Kindle. You can find information on the site and their formatting guidelines here.